All Natural Crystals Free of Additives. 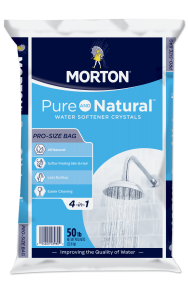 Morton Pure and Natural is a natural choice for treating your water. A high-purity salt with no additives, Morton® Pure and Natural™ helps improve life at home in many ways – from softer laundry to helping keep dishes spot-free. Morton® Pure and Natural™ is 99.8% pure salt.